The Vikings begin reporting to the first training camp July 24 at the TCO Performance Center in Eagan. Before then, the Star Tribune will take a look at each position group. Sunday: Running backs. (+) Restructured Latavius Murray’s contract, saving more than $1 million in cap space while allowing Murray to become a free agent after the season. … Signed three UDFAs in Boone (Cincinnati), Thomas (Jacksonville State) and Stanton (UNLV). (-) Jerick McKinnon signed a four-year, $30 million contract with the 49ers, including $11.7 million guaranteed at signing. 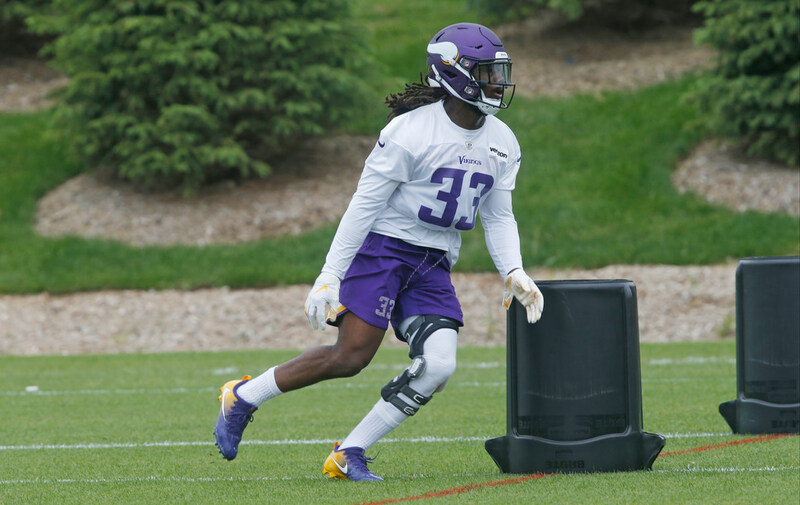 Cook, the Vikings’ workhorse, enters camp with both his ongoing rehab and a reworked offense to think about. Movement, screens and space are common descriptors for first-year coordinator John DeFilippo’s touch on the offense. Cook is still in the type of system he feels most comfortable, which is predicated on zone blocking and allowing his superb vision to take over. A critical move, because of Cook’s recovery and short-yardage situations, was retaining Murray. The veteran improved throughout his first season with the Vikings and Murray will still play a role regardless of Cook’s health. Will there be any need to hold back Cook? His rehab from a torn ACL is on schedule, returning to team drills this spring about 8.5 months after surgery. Indications are he could be near full go for training camp, however head coach Mike Zimmer is eager to see him in pads and around live contact again. The Vikings don’t want to overdue it too soon with Cook, keeping the focus on Week 1 against the 49ers. The Eagles didn’t use a fullback in two years with John DeFilippo on staff as quarterbacks coach. The Browns sparingly used the position when DeFilippo was coordinator in 2015. So what kind of role can C.J. Ham play in this Vikings offense? He returned to his roots, playing more running back this spring with the third-team offense. Ham caught seven passes for 68 yards last season, his first as a contributor. 70 percent — This wasn’t a running back by committee before Cook’s knee injury in Week 4. The Vikings played Cook about seven of every 10 plays, making clear their commitment to a dynamic talent. His reps will be monitored in the preseason. Should Cook’s initial reps and continued rehab look good, there’s no reason to think he won’t again become a No. 1 option in the offense. No. 3 running back — McKinnon entered last season as the Vikings’ third backfield option and ultimately played an integral role in the offense. The preseason could offer surprises from a relatively unproven group in Ham, Brown, Boone and Thomas.